The conformation of your horse and yourself determines the size of the saddle. 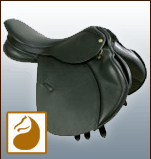 Depending of where the saddle is made, saddle sizes are measured in cm or in inches. Below you will find a guideline to determine what size you would need. Best is of course to have your saddle fitted by a qualified saddle fitter. An ill fitted saddle may hurt your horse: do not hesitate to ask us for more advice! The seat should provide a comfortable but not too large seating area to ensure the rider’s position is as stable as possible. Find the saddle size that fits you in the correspondence table below, but remember, it’s only a guideline! Note: Also remember to check the width and length of your horse’s withers and therefore the opening of the gullet of the saddle. The morphology of the horse determines the opening of the gullet arch, that is to say the part situated at the front of the saddle. The description of our saddles indicates whether the saddle is suitable for a high or medium wither. If your horse has a low wither, the height of the opening of the gullet is never a problem. In order to obtimize your choice, it is best to try the saddle on the back of the horse. If it fits your horse, the saddle naturally lands on its back and follows the horse’s shape. To check the gullet height, your hand must pass comfortably between the pommel and the withers of the horse, without being stucked. It must first be seen without being girthed and without a rider. It is better to ask somebody else to check when mounted. 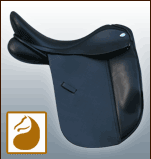 If you do not pay attention, an ill fitted saddle can give physical, behavioural or training problems. For the rider, when a saddle is not well balanced on the horse’s back, it will put you in a chair seat often when the saddle is too narrow (more pressure in the thoracic-lumbal area; saddle slips on the neck) or in a fork seat often when the saddle is too wide (saddle bounches on the horse’s back in trot and drops at the front; more pressure in wither and shoulder region). If you have bought a new saddle, or if your old saddle has been completely reflocked, the saddle should be reviewed after 8-12 weeks. The flocking of your saddle will settle down, which can change the balance of your saddle. By adding some flock the balance will be restored. This should be done on the spot because the saddle should be checked while ridden. In addition, we recommend that you have your saddle checked twice a year by a certified saddle fitter. For a young horse or a horse that is expected to change in size, it is desirable to have this done 3 times a year. All this to prevent problems. Prevention is always better and faster than cure.